Ticket price per child for ages 4-10. Children 11 and up must pay the adult price. Not able to attend, but would like to contribute a donation for the anniversary event. Donations can be increased by increments of $25. Ticket price if you are purchasing more than one event ticket. Event ticket for a single individual. To register for more than one type of registration, such as an adult and a child ticket, you must first select the multiple adult registration and confirm, then before paying, come back to this event page and select the child ticket option, confirm then go to the payment option to pay online. Your registration for the event is not complete until payment is received via the online payment option. 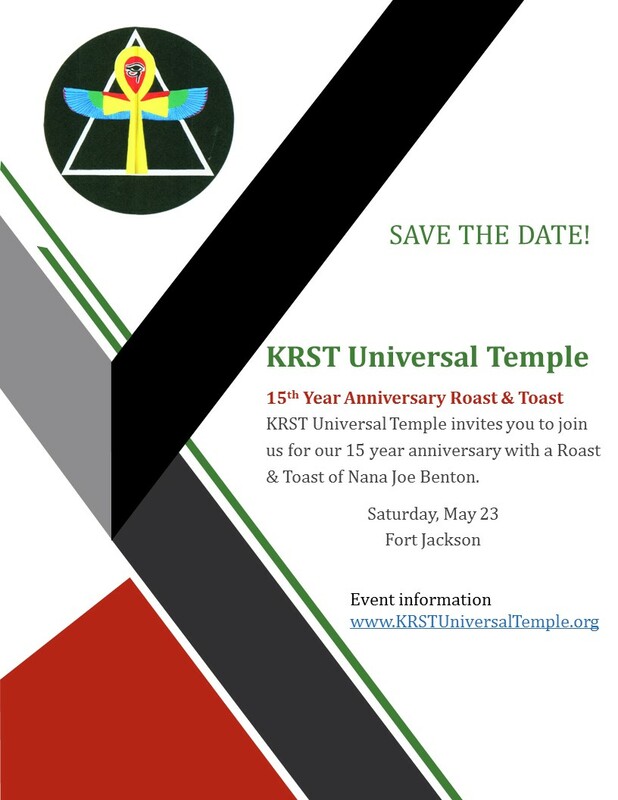 KRST Universal Temple invites you to join us for our 15th anniversary celebration with a Roast & Toast of Nana Joe Benton. The event will be held Saturday, May 23, 2015 at the NCO Club on Fort Jackson, 6p.m. to 9p.m., 5700 Lee Road, Columbia, SC. Use the Forest Drive entrance. Must have all driver and vehicle identification. The roasters will share their experiences and humorous stories of the honoree. The roast will also feature a silent auction where guests will have the opportunity to bid on items that celebrate the best of our African and African American history and culture. Visit the Silent Auction Gallery. All Individuals registered by April 30 will be entered into a drawing to have their DNA genealogy profile completed by AfricanAncestry.com, a value of $300. To register for more than one type of registration, such as an adult ticket and a child ticket, you must select the multiple adult registration first, include the quantity and confirm, then before paying, go back to the event page and select the child ticket option, include the quantity, confirm and then go to the payment option to pay online.